Oman Medical College, Muscat, Sultanate of Oman. Address correspondence and reprints request to: Shah Alam Khan, Oman Medical College, Muscat, Sultanate of Oman. Duraz AY, Khan SA. Knowledge, Attitudes and Awareness of Community Pharmacists Towards the Use of Herbal Medicines in Muscat Region. Oman Med J 2011 Nov; 26(6):451-453. Objective: This study aims to investigate the knowledge and attitudes among pharmacists in Oman towards the specific use and knowledge of herbal drugs. Methods: The study was conducted on 100 pharmacists employed in Oman. The data was collected using two self- administered questionnaire containing 7 and 11 closed ended questions in each, respectively. Results: The mean age of pharmacists was 32.6 (SD=5.6) years. The majority of pharmacists were interested in herbal information and their herbal information mainly comes from their previous classes during college. Most of them have belief on the effectiveness of herbal products. Pharmacists were more knowledgeable on specific therapeutic indications of herbal products rather than on other areas such as drug- herb interaction or side effects. Conclusion: In summary, Pharmacists need to be informed on the therapeutic indications, drug interactions, dose, active constituent and precautions of herbal products. Concerned bodies must also provide them with regular continuing education programs apart from putting their effects to incorporate relevant topics in herbal medicine in pharmacy curriculum. Keywords: Herbal drugs; Herb-drug interaction; Pharmaceutical care. Community pharmacists are the most accessible healthcare providers and according to a study conducted in the US, they are more queries from patients about herbal products than ever before.6 Similar studies have also been conducted in Nigeria,7 United Arab Emirates,8 and Saudi Arabia,9 to assess the knowledge and attitude of community pharmacists towards the use of herbal drugs. Pharmacist being the link between the patient and drug usage, can play an important role in creating awareness and advising the patients about the rational, safe and proper use of these medicines.10 However, to advice in a proper manner, pharmacist must have knowledge about the therapeutic indications, dosing, side effects, toxicology and potential interactions of herbal medicines with modern medicines. Therefore, the present study was conducted with an aim to assess the knowledge, attitude, awareness and dispensing practices among community pharmacists in Muscat region towards the specific use and safety of herbal drugs. Muscat is the capital city of Sultanate of Oman, a gulf country with a developing healthcare system, located in the Southeastern portion of the Arabian peninsula. More than 140 private pharmacies are located across Muscat city providing round the clock healthcare services to the public. Thirty-five community pharmacies were randomly selected based on their geographical distribution (i.e. north, south, east and west) in Muscat city and a cross sectional survey was conducted during May-June 2010. A total of 100 pharmacists participated in the study. Data collection was carried out using a structured self administered questionnaire, especially designed for this study. The questions were mainly close ended or Multiple choice type and were distributed to the pharmacies after validating the questionnaire for readability, question design and length by a pilot study on 5 pharmacists. Data were analyzed using SPSS v. 13.0. Categorical variables were described using frequency distribution and percentages. Mean and standard deviation were calculated for age variables and median for experience. Table 1: Pharmacists characteristics, attitude, and opinion about herbal drugs. According to pharmacists' opinions; cough preparations (Thyme or ivy leaves extract) were the most widely dispensed drugs (54%), followed by rejuvenators and vitalizers (ginseng, 23%) and slimming agents (10%). A total of 62 pharmacists believed that mostly middle aged adults seek counseling on herbal drugs followed by elderly (25%) and children (13%). The Pharmacists' view regarding the recent trend in increase dusage of herbs suggested that a considerable proportion of the respondents believed that herbs are safe (26%), effective (51%), natural (46%) and nowadays people do not trust conventional medicines because of their cost and side effects (10%). 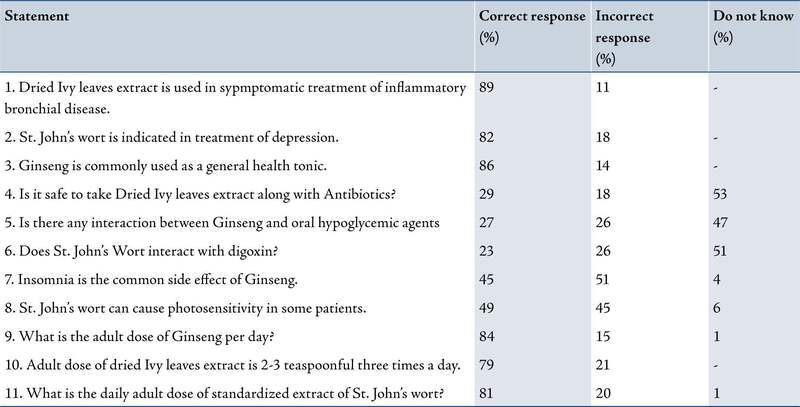 Three herbal drugs namely dried Ivy leaves extract, Ginseng and St. John’s wort were selected to evaluate the pharmacists knowledge about the safety of herbs (Table 2). The pharmacists were asked 11 questions pertaining to the therapeutic use, herb-drug interaction, adult dose and the most common side effect of the selected herbs and it was observed that more than 3/4th of the pharmacists had good knowledge of the therapeutic indication (89%, 82% and 86% respectively), and adult dose (79%, 84%, and 81% respectively) of Ivy leaves extract, Ginseng and St. John’s wort. However, only 1/3rd of the participants could recognise possible drug-herb interaction and around 50% of the participants were unaware of any interaction reported in the literature between the selected herbs and common drugs used in the management of chronic diseases like hypertension and diabetes. Thus it can be concluded from the current study that community pharmacists are very much aware of upsurge in herb usage as a number of people seeking their advice on herbal drugs is on the rise. They are increasingly being sought out as sources of information regarding herbal medicines as they are easily accessible. Majority of the respondents have a belief on the effectiveness and safety of herbal products reflecting a positive attitude towards dispensing herbal medicines but their knowledge about the side effects and herb-drug interaction was found to be inadequate for an effective advising and patient counseling. In order to provide the optimal care and counseling for patients who use herbal drugs, pharmacists need to be well informed about the use and safety of herbs. This can be achieved by providing education and training to the practicing pharmacists by organizing continuing medical education programs focussed on safety, potential harmful effects and rational use of herbal medicines. Authors declared no conflict of interest and no funding was received for this work. 1. WHO. Regulatory situation of herbal medicine. A world wide review. Geneva, 1998. 2. Abu Melha A, Ahmed NA, el Hassan AY. Traditional remedies and lead intoxication. Trop Geogr Med 1987 Jan;39(1):100-103. 3. Astin JA. Why patients use alternative medicines: results of a national study. JAMA 1998;27(19):1548-1553 . 4. Hasan MY, Das M, Behjat S. Alternative medicine and the medical profession: views of medical students and general practitioners. East Mediterr Health J 2000 Jan;6(1):25-33. 5. Hussain K, Majeed MT, Ismail Z, Sadikun A, Ibrahim P. Complementary and alternative medicine: Quality assessment strategies and safe usage. Southern med review 2009;2(1):19-23. 6. Clauson KA, Mc-Queen CE, Sheild KM, Bryant RJ. Knowledge and attitudes of pharmacists in Missouri regarding natural products. Am J Pharm Educ 2003;67:301-309 . 7. Adisa R, Fakeye T. Assessment of the knowledge of Community Pharmacists regarding common phytopharmaceuticals sold in South Western Nigeria. Trop J Pharm Res 2006;5(2):619-625. 8. Fahmy SA, Abdou S, Abulkheir M. Pharmacists’ attitude, perception and knowledge towards the use of herbal products in Abudhabi, United Arab Emirates. Pharmacy Practice. 2010;8(2):109-115. 9. Alkharfy KM. Community pharmacists’ knowledge, attitudes and practices towards herbal remedies in Riyadh, Saudi Arabia. East Mediterr Health J 2010 Sep;16(9):988-993. 10. Meinhardt RA, Richardson C, Ohlinger P. Alternative medicine and pharmacists counseling obligations. Drug benefit trend 1998;10:24-28.